NEW YORK'S HIGHEST RATED CLEANING SERVICE ON GOOGLE! John did a great job for us. He was on time and did a very thorough job. Our rug needed to be re-stretched and he did a very professional job. Highly recommend Hoffman Carpet Cleaning. Friendly, quick and great results! John and Kyle did an outstanding job cleaning our carpets! We highly recommend Hoffman Carpet Cleaning service. Thank you for your fantastic service and attention to detail! I called Hoffman’s just before closing time and told them I needed someone that night. They dispatched John. He arrived promptly, worked fast, efficiently, did a thourough job. He provided excellent service and was extremely polite. I will always use and refer Hoffman’s Cleaning Service. John was very prompt & thorough cleaning the office carpets today. I'm extremely pleased with his knowledge & experience. Plus, he has a great personality! Not only was it so easy to schedule online, but the technician could not have been friendlier. He called to give me his exact time of arrival, provided a detailed overview of the pricing, and finished in record time! While quick, each area was done thoroughly, and he even asked... read moreNot only was it so easy to schedule online, but the technician could not have been friendlier. He called to give me his exact time of arrival, provided a detailed overview of the pricing, and finished in record time! While quick, each area was done thoroughly, and he even asked if I approved prior to completing the final component of the job! It was amazing to have your entire upstairs carpets cleaned and treated all before noon on a Saturday! John came to our house twice to clean our carpets. He is amazing at what he does and very friendly. Used Hoffman recently to clean some carpets in our new house, as well as a couple of couches, and was very pleased. When I initially reached out, I heard back from the owner, John very promptly who provided me with all of the pertinent information and answered my questions thoroughly.... read moreUsed Hoffman recently to clean some carpets in our new house, as well as a couple of couches, and was very pleased. When I initially reached out, I heard back from the owner, John very promptly who provided me with all of the pertinent information and answered my questions thoroughly. All of our communication was done via email which was great for me, since I was in contact while I was at work. We were able to set something up for maybe 2 business days after I initially contacted him. His crew of two guys showed up before their scheduled time, and left my carpets looking and smelling refreshed. They were able to complete stairs, a long hallway, and 4 bedrooms on the second floor in a couple of hours. They were also super friendly to deal with. The only reason for downgrading one star is because there was a little mix up regarding our furniture at first. I actually left the house while the carpets were being cleaned, and they apparently had run out of water and didn't do the furniture at that time because it wasn't written in their schedule. I reached out to John to see what had happened, and his staff called me apologetically to set up another time to come and finish the job. It was a little inconvenient not having the job completely done the first time around, but their prompt attention to setting up another appointment, and apologizing for the error made it right in my book. Also, had I not chosen to communicate via email, the instructions on my end may have been more clear. I highly recommend Hoffman Carpet Cleaning. Lavar was very professional and nice. He was prompt and efficient, price was very reasonable and my pet stained carpet looks great!! I been hired some carpet clean company to come my house to clean before. But I not so happy what the results is. So I try Hoffman this time.They cleaned living room,stairs and upstairs hallway. I have to say is Amazing and Super Clean.The guy called John. He pay attention to every... read moreI been hired some carpet clean company to come my house to clean before. But I not so happy what the results is. I have to say is Amazing and Super Clean.The guy called John. He pay attention to every Corner gaps. And the hard wood clean machine they use it's too wide to clean my floor. So he clean these hard floor by hand. The results are even better! I'm really happy by how he did and the results are. I'm tempted to lobby for a new category, something like 5*-asterisk: for the very, very few businesses that merit 5* not once but repeatedly. These folks came to clean our carpets in the basement post-flood: very nearly as good as new, well above expectations. One of the rugs had been... read moreI'm tempted to lobby for a new category, something like 5*-asterisk: for the very, very few businesses that merit 5* not once but repeatedly. These folks came to clean our carpets in the basement post-flood: very nearly as good as new, well above expectations. One of the rugs had been the target of repeated cat urine attacks: they took it to their facility and cleaned it via full submersion several times until it came back usable - and at no extra charge. The ONLY folks to clean carpets! Isiah is a star manager! All of them are perfectionists, and won't leave until they are happy with their work! Reasonable prices as well. I have used these guys 5-6 times over the last 5-6 years. We have a pet who has stained the couch when we have left her alone. John has always taken care of it immediately and always with a smile. His company has cleaned my furniture and carpets a couple... read moreI have used these guys 5-6 times over the last 5-6 years. We have a pet who has stained the couch when we have left her alone. John has always taken care of it immediately and always with a smile. His company has cleaned my furniture and carpets a couple of times. Very fair pricing and excellent service. WHAT DO YOU LOOK FOR WHEN YOU HIRE A CLEANING SERVICE COMPANY? 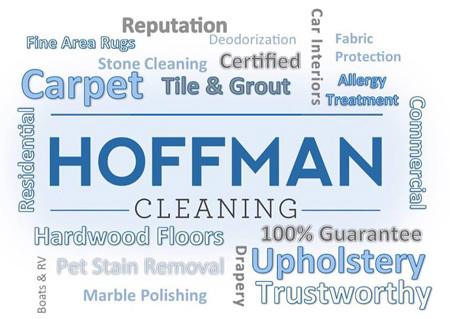 At Hoffman Cleaning, we know that first impressions are extremely important, and you want your service professional to be polite, on-time, reputable, well-groomed, and representative of the company (in uniform). You won’t get this when hiring the cheapest or first cleaning company you call. At Hoffman, our mission is to offer the very best cleaning services that you expect, without breaking the bank. We may not be the absolute least expensive option, but we can assure you that we will provide the best possible service – service that we proudly stand behind. At Hoffman, it means that we do everything in our power to exceed the expectations you’ve set for us. Being in the service industry, we understand that mistakes do happen, but in that event, we will always come back to fix anything you are unhappy with; no questions asked. 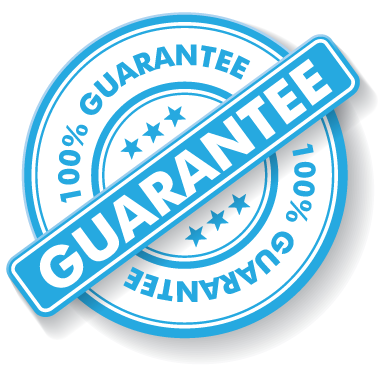 If you are unsatisfied with our work for any reason, we will refund the total cost of your service. Hoffman Cleaning, we are interested in only one thing – excellence. Stay up to date with our service specials and more!